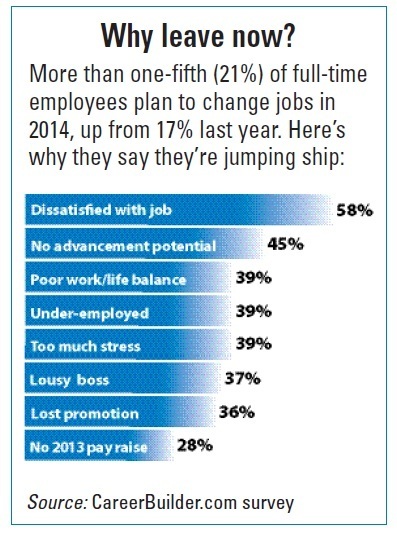 With the economy improving, your employees have more options to jump ship. But if you know how to look for the warning signs of employee discontentment, you can take quick action to prevent a good employee from becoming an ex-employee. Those warning signs aren’t always what you’d expect. Taking more vacation time and punching out right at 5:00 p.m. every day, for example, aren’t necessarily behaviors of people who are about to leave, says a new study by Tim Gardner, a Utah State University business professor. The study says the one thing most employees have in common before they leave is they begin to “disengage” in the workplace. “As the grass starts to look greener on the other side of the fence to you, chances are that others will soon notice that you’ve lost your focus,” says Gardner. They offered fewer constructive contributions in meetings. They were more reluctant to commit to long-term projects. They become more reserved and quiet. They become less interested in advancing in the organization. They were less interested in pleasing their boss than before. They avoided social interactions with their boss and other members of management. They suggested fewer new ideas or innovative approaches. They began doing the minimum amount of work needed and no longer went beyond the call of duty. They were less interested in participating in training and development programs. Their work productivity went down. If an employee demonstrates at least six of these behaviors, the statistical formula predicts with 80% accuracy that the person is about to leave the organization. “You might think that someone who starts showing up to work late, failing to return phone calls or emails and taking lots of sick days might be about to leave, but those weren’t unique behaviors that applied only to quitters,” says Gardner.